Hi English learners! Lori here, your teacher from Betteratenglish.com. In this episode of Real English Conversations, you’ll hear part 3 of my conversation with Kyla. We are talking about the book Daily Rituals by Mason Currey. In this part we talk about the routines and practices that many creative people have in common. Now before you listen I have to warn you: this is a particularly challenging conversation. Here is why: because both Kyla and I read the book, we have a lot of shared information in our heads. When speakers have a lot of shared information, they often leave out details. They know that the other person already knows the information, so they don’t have to say it. If only one of us had read the book, this conversation would have been very different. We would have had to do a lot more explaining, and mention a lot more specific details. What does all that mean for you? As you are listening, don’t worry too much if some things are unclear, or if you feel that you are missing information. To help you out, I have marked the particularly challenging parts in colored text in the transcript. And at the end of the transcript, I’ve included a short quote from the book so you can read the part we are talking about. After the conversation I’ll be back with five questions you can use for speaking practice. Lori: That was another really striking one – the role of walking. 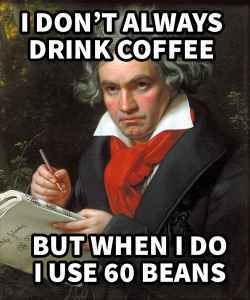 Beethoven was one of the many creative people whose daily routine involved strong coffee. Lori: How many was it in each cup? Lori: That sounds right. Yeah, he measured up precisely 60 beans for his coffee and would work. And then he would take these long, vigorous walks armed with note paper to jot down ideas, I guess. And I think it was also Beethoven who would, during his work periods when he would feel stuck, he would get up and go walk outside for a little bit and found that , kind of, unlocked his creativity. Download the transcript for the rest of this Real English conversation, the vocabulary lesson and bonus discussion questions for speaking practice.